We are working on topics falling into two different areas: Nonlinear Dynamics (e.g. Pattern Recognition, Pattern Formation during Si-Electrodissolution, Pattern Formation in Electrocatalytic Reactions, Complex Ginzburg-Landau Equation) and Artificial Photosynthesis - Photoelectrochemistry. The research of our group is focused on the detailed understanding of magnetization dynamics in hybrid materials comprising of ultrathin magnetic layers in combination with topological materials or with materials inducing strong interfacial spin-orbit interaction. We tailor novel hybrid magnetic structures and investigate their static and dynamic magnetic properties. Among the subjects covered in our research are the dynamics in confined magnetic systems, magnonics, spin orbitronics, hybrid topological materials, high resolution magnetic microscopy as well as magnetic phase transitions in low dimensional systems. In our group we use several techniques to examine magnetization dynamics, the propagation of spinwaves and the efficiency of charge to spin current conversion. At the heart of our research projects are various time and spatially resolved high resolution magnetic microscopy techniques. Our work at the Walter Schottky Institut deals with various aspects of new and non conventional semiconductor materials and material combinations: semiconductors with a wide bandgap, disordered semiconductors, advanced thin film systems etc. We examine the physical fundamentals of material properties using scattering methods (neutrons-, x-ray and dynamic light scattering). The general goal of our research is to jugde from the knowledge of the microscopic dynamics and structure for explaining the functional characteristics of condensed matter. Our group explores a wide range of topics related to the fundamental physics of nanostructured materials and their quantum-electronic and -photonic properties. We study the unique electronic, photonic and quantum properties of materials patterned over nanometer lengthscales and explore how sub-components can be integrated together to realise entirely new materials with emergent properties. This convergence of materials-nanotechnology, quantum electronics and photonics is strongly interdisciplinary, spanning topics across physics, materials science and engineering. The research of our group aims at a broad range of questions from condensed matter theory and bridges to quantum optics, atomic physics, and computational sciences. Interactions and correlations in condensed matter systems often manifest in striking and novel properties. These properties emerge from collective behavior of the quantum particles. Many examples can be found in nature, including superconductors, quantum magnets and superfluids. Our research address various questions in non-equilibrium quantum dynamics and transport in ultracold quantum gases, interacting light-matter systems, and correlated quantum materials. Our group aims at investigating processes inside atoms and molecules on the shortest timescale reached so far, the attosecond timescale. One attosecond compares to one second like one second to the age of the universe. New insight into ever smaller microscopic units of matter as well as in ever faster evolving chemical, physical or atomic processes pushes the frontiers in many fields in science. The interest in these ultrashort processes is the driving force behind the development of sources and measurement techniques that allow time-resolved studies at ever shorter timescales. Our research focuses on the creation of nanoscale model systems on atomically tailored surfaces, enabling the study and control of single-molecule processes as well as the self-assembly of supramolecular structures. The studies are inspired by the chemistry of life – which shows how functionally versatile a single set of molecular building blocks can be – and oriented toward innovation in nanotechnology. The Holleitner group investigates optoelectronic phenomena in nanoscale circuits with special focus on ultrafast optoelectronics, quantum optoelectronics, and excitonic systems. The research topics aim to fully exploit the potential of nanoscale circuits for optoelectronic and photovoltaic applications, as well as for communication and information technologies. Scientific activities covered by our group include the fundamental properties of magnetic and superconducting materials (bulk compounds and thin films), materials science and a few selected problems in particle physics. Our group has a long tradition in neutron related research, notably the development of state-of-the-art neutron scattering techniques. Research at E20 aims at the fundamental understanding of interface phenomena and their control for the design of functional nanoarchitectures in reduced dimensions. We investigate and manipulate individual nano-objects and highly organized supramolecular systems. We conduct research in the area of the physics of energy conversion and storage. The main topics include the design and implementation of functional materials and a better understanding and characterization of electrified interfaces. The material design is based on a bottom-up approach using input from electrochemical surface science and starting from model surfaces. The Soft Matter Physics Group investigates the structure, dynamics and kinetics of nanostructured polymer systems, e.g. amphiphilic and switchable block copolymers, thin polymer films, as well as polymers for medical applications. We mainly use scattering methods both at large facilities and in the lab. We represent at the TUM the wide field of plasma physics in research and teaching. The focus of our work lies on magnetized high-temperature plasmas as they exist in fusion experiments as well as in the universe. Of special interest for our research are processes relevant for developing a future energy source based on fusion reactions in magnetically confined plasmas. Our group focuses on Quantum Matter, materials with unusual electronic properties. We study these materials by experimental investigations at very low temperature and under high magnetic field and high pressure. Particularly, we are trying to understand the electronic behavior in novel states of matter through a direct detection of the Fermi surface via quantum oscillations, a fundamental “fingerprint” of a material. Our group focusses on Quantum Technologies. We make chips using state-of-the-art nanofabrication techniques to study quantum effects in a variety of systems. Another important topic is integrated quantum optics, where photonic chips with functionality to generate, manipulate, and detect single photons are designed, made, and measured. 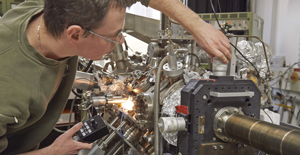 The research activities of the Walther-Meißner-Institute are focused on low temperature solid-state and condensed matter physics. The research program is devoted to both fundamental and applied research and also addresses materials science, thin film and nanotechnology aspects. We are interested in a variety of problems in condensed matter theory. Our main focus lies on the study of phenomena which arise due to quantum mechanical effects in systems of correlated electrons. Areas of research include the study of topological phases of matter, geometrically frustrated systems, dynamics in quantum many-body systems, and the applications of quantum information concepts to condensed matter physics. Scientific activities covered at our institute include the fundamental properties of magnetic and superconducting materials (bulk compounds and thin films), materials science and a few selected problems in particle physics. 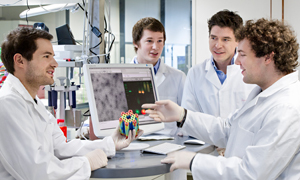 The institute has a long tradition in neutron related research, notably the development of state-of-the-art neutron scattering techniques. Research in the theory group led by Prof. Wilhelm Zwerger is focused on quantum and statistical physics in a wide range of areas, from condensed matter physics and nanostructures to ultracold gases and the interface between quantum optics and solid state physics. We are working in collaboration with a number of groups in the Munich area and beyond, in particular with the Max-Planck-Institute for Quantum Optics (MPQ) and within the Nano-Inititative Munich (NIM).